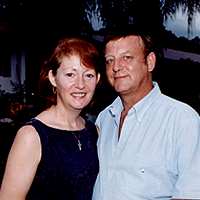 Irish Eyes has celebrated 31 years of bringing Ireland to the people of Virginia. During this time we have shared the Irish Traditions, from the cradle to the grave, with helpful advise on baptisms, first communions, school projects, weddings and wakes. The very personal service that Bernadette offers, with her Galway Drawl, (accent) has set her apart from other Celtic stores in the country. Her customers are willing to travel from the Carolinas, West Virginia, Maryland and Pennsylvania, and the stores guest book boasts praises of her efforts by Celtic people from around the world. The recent addition of the Heraldic Research Center has captured the interest of young and old alike, in the wealth of our Celtic Heritage. Irish Eyes offers a more comprehensive knowledge of Heraldry and all Heraldic Insignia, than any other Celtic store that you may have had occasion to visit.